Hanoi (VNA) – President of the Vietnam General Confederation of Labour (VGCL) Bui Van Cuong has expressed his wish that ties between the Vietnam Trade Union and Belgium will further develop in the near future, thus better protecting legitimate rights and interests of the two countries’ workers. During a reception in Hanoi on March 26 for Belgian Ambassador to Vietnam Paul Jansen, Cuong said amid Vietnam’s widespread global integration, the Vietnam Trade Union is renewing itself to meet demand in the new situation, including focusing on its core task of representing, protecting and caring for workers and trade unionists, and building a contingent of professional trade union cadres able to fulfill assigned tasks. The Vietnam Trade Union will also enhance global integration and learn from foreign experience, he said. 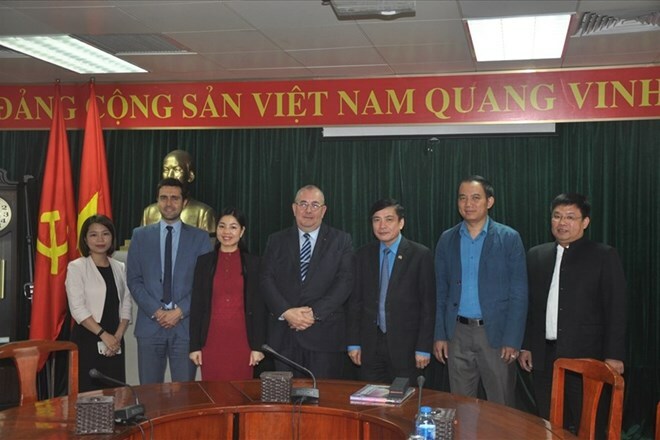 Cuong hoped that the ambassador would serve as a bridge connecting Vietnamese and Belgian trade unions together, enabling the Vietnam Trade Union to negotiate the signing of a collective labour agreement, especially at the sectoral level in the time to come. The host wished that Jansen would have a successful tenure in Vietnam, contributing to reinforcing ties between the two countries and their trade unions. Ambassador Jansen, for his part, expressed his wish that the Vietnam – EU Free Trade Agreement would be signed soon.